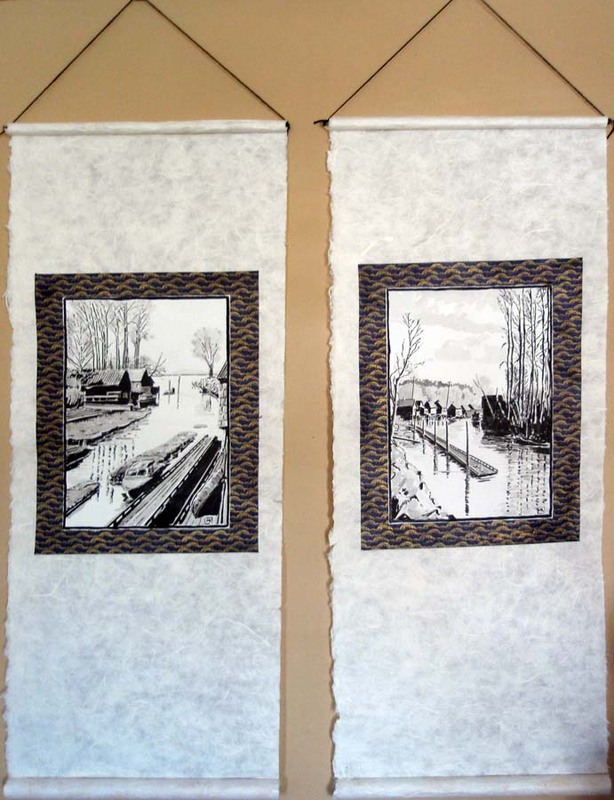 These are tone drawings with the Chinese ink stick and brush (see the entries below for June and July of last year) laminated onto a decorative paper and then onto mulberry paper and glued into two scrolls. I've been wanting to do a scroll for years and finally got around to it in time for this year's Finn Slough Art Show, which I've participated in at various times over the past decade or so. The show opens April 11th at the Richmond Museum and Cultural Centre; I've put these images on my chiaroscuro page and also on the Finn Slough historical page on this website. 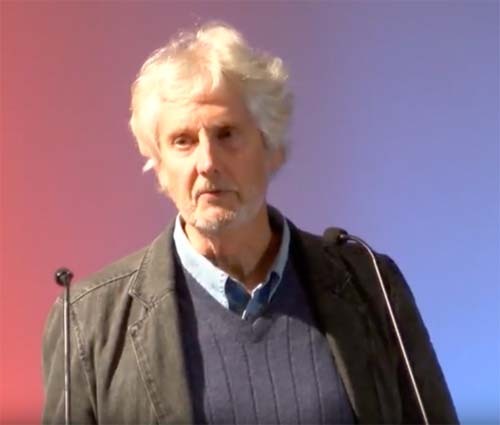 RIP Allan MacDougall (1947 – February 19, 2019), who died following a terrible 10-year decline with Alzheimer's. Allan and Mark Stanton got me going in publishing in 1981–2 by distributing my early books, then came into my life again as distributors for Whitecap around 1990, then published 4 books under their Raincoast imprint from 1996 to 2000. 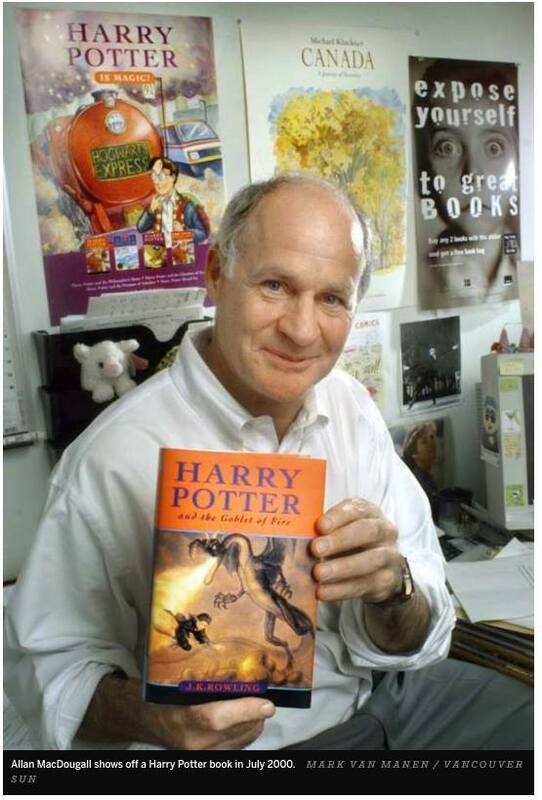 A publicity photo of him holding one of the Harry Potter books – his greatest business triumph as the Canadian distributor of that series – showed he had a poster for my Canada book in his office. In the same room with fame, indeed. 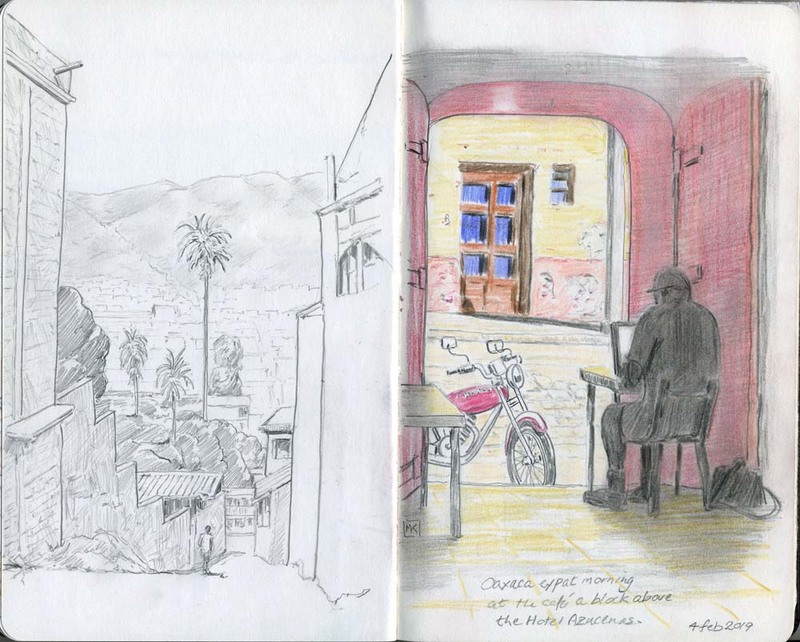 Back out travelling again with the sketchbook, this time to Oaxaca and other places in Mexico. 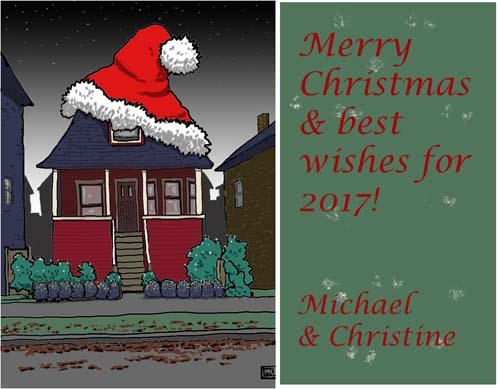 Correspondence about the Quiney houses in Kitsilano prompted me to redo that page with images from Kitsilano pioneer days. 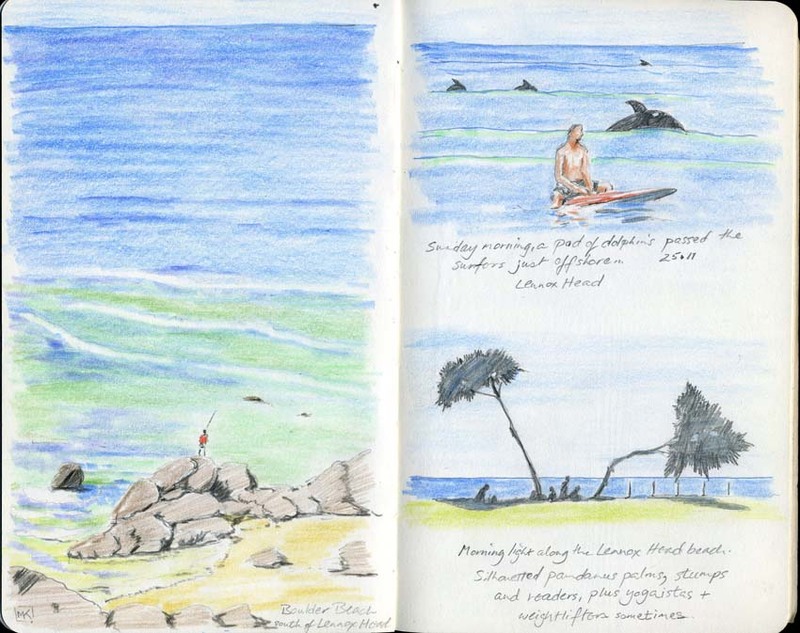 Coloured-pencil travel drawings from trips in 2018 to Banff and Australia. Another trip linked from my travel page. 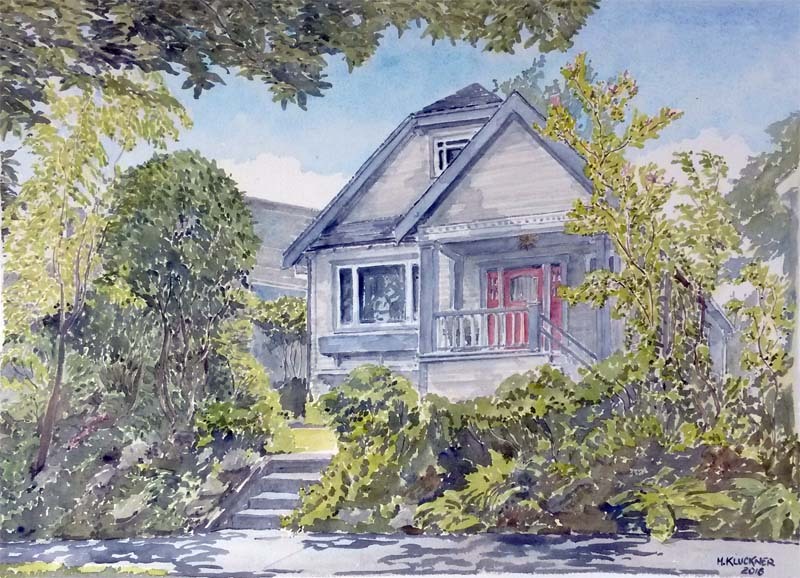 ... a final watercolour commission for the year of a fine Vancouver Shaughnessy home, added to the Commissions page. 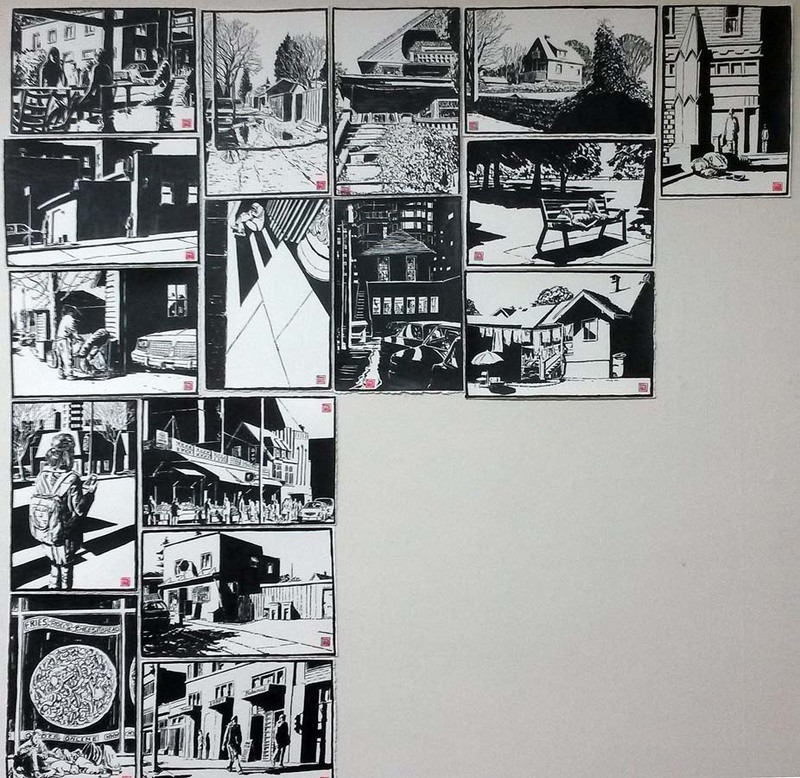 A wall in the studio is filling up with chiaroscuro - brush ink drawings, all for sale on this page. 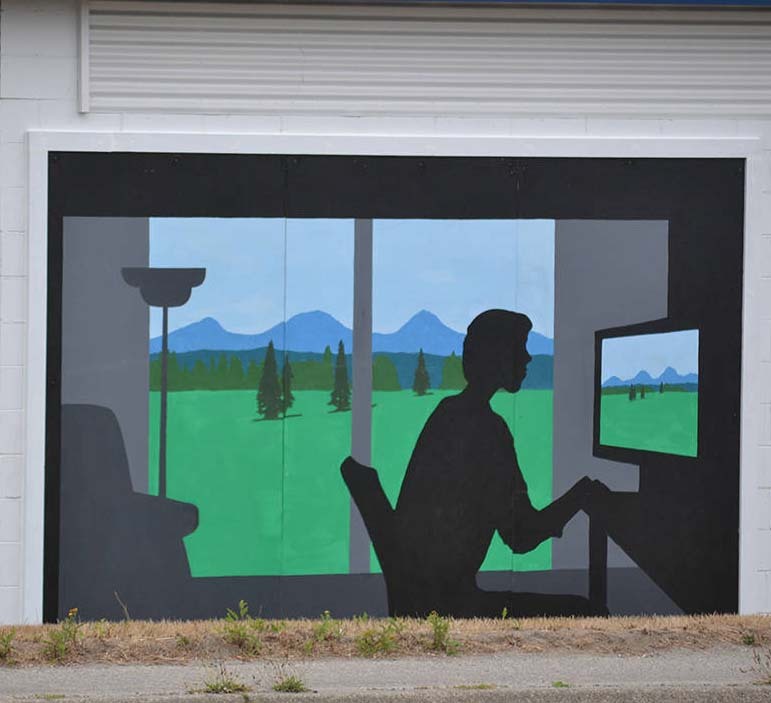 "New Reality," my 8 x 12 foot contribution to Susan Gorris's wonderful mural project for a building on the western outskirts of Aldergrove, BC, about 270th Street on the Fraser Highway, involving 10 artists. Fun to work (for the first time ever) at that size and in acrylics. 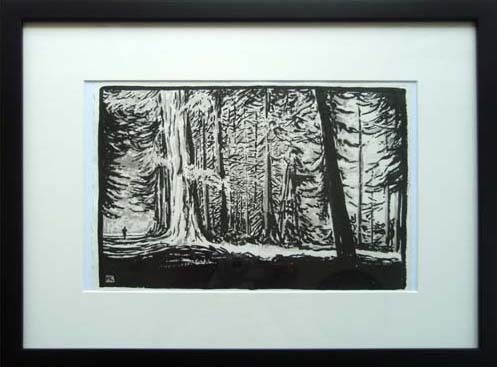 I've added a page of purely black & white artwork, one of the series of pages linked from the art index page. 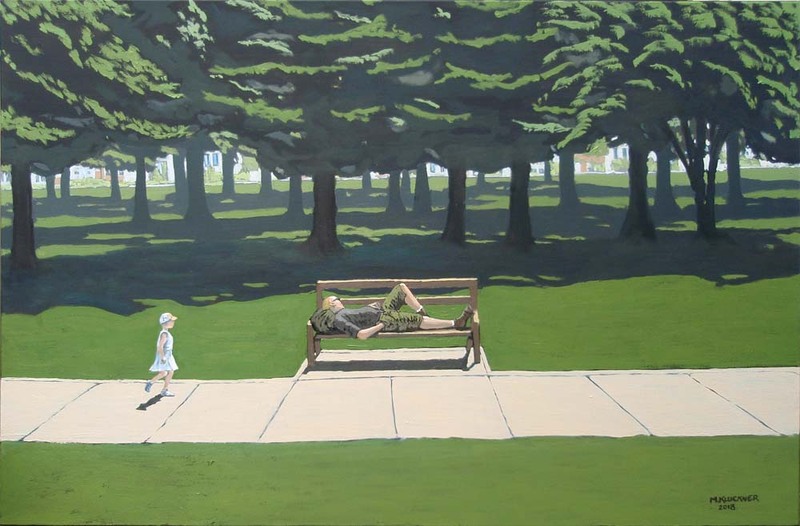 Summertime seems to be oil painting time this year – fewer of the commitments that break up the day, weather too hot to do much outside from midday till 5 or so. Unlike the other types of artwork I do, oils require a few hours (at least) to justify getting everything dirty and then cleaning it up. 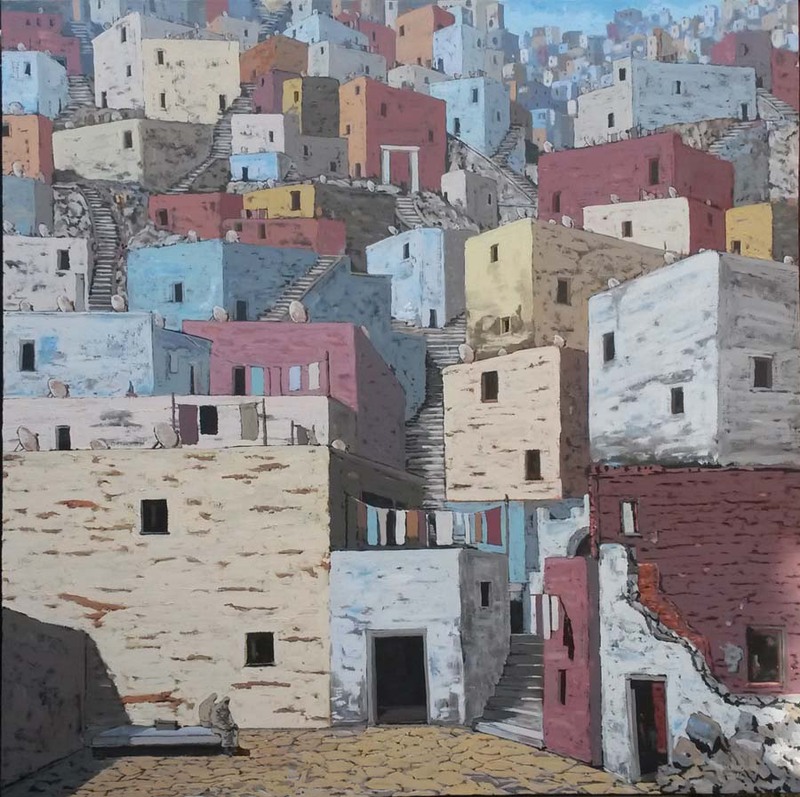 The two below are added to my painting page. •Rossland Museum & Discovery Centre, June 26, 7 pm. 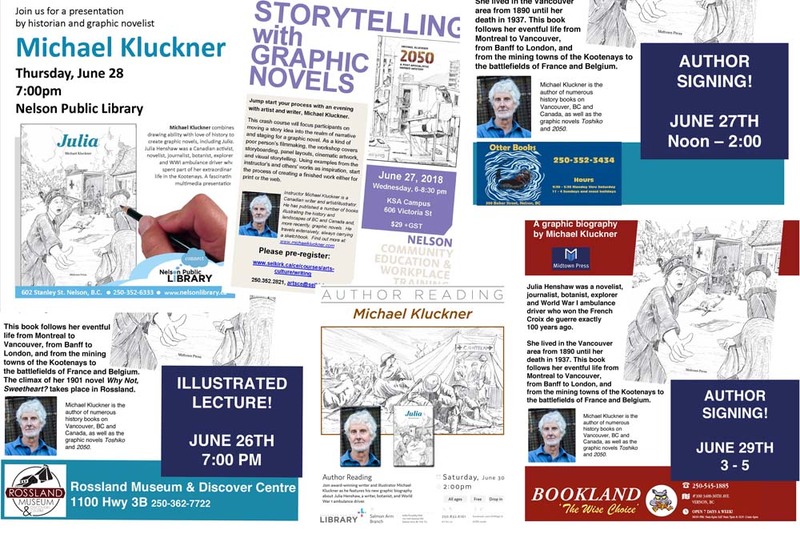 • Salmon Arm Public Library, June 30th, 2 pm. 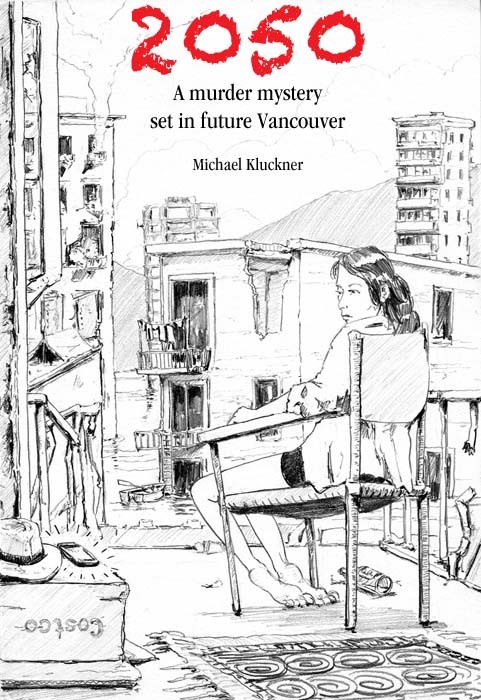 • VanCAF, the comic arts festival, at the Roundhouse Community Centre on Saturday and Sunday May 19 and 20. 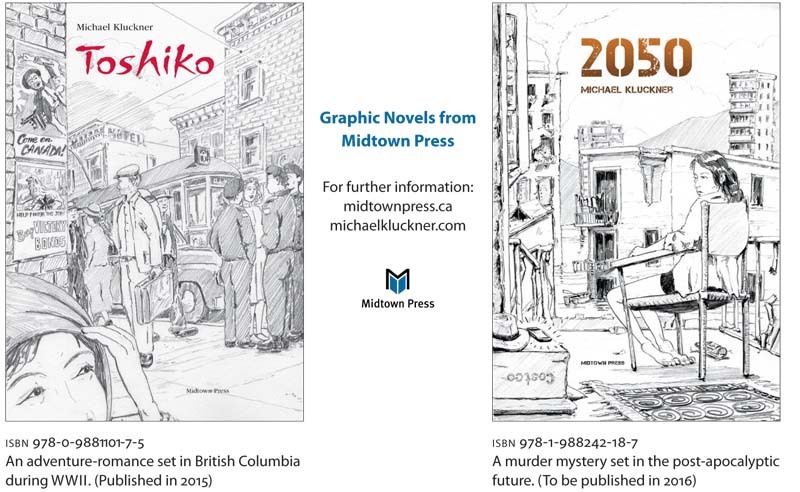 I will be there for much of the weekend at the Midtown Press table. • A brief talk and signing at Black Bond Books in Ladner, June 9, 10:30–12:30. • Rossland Museum & Discovery Centre, June 26, 7 pm. • Friends of the BC Archives, Victoria, October 21st. • Vancouver Public Library main branch, November 1, 7 pm. 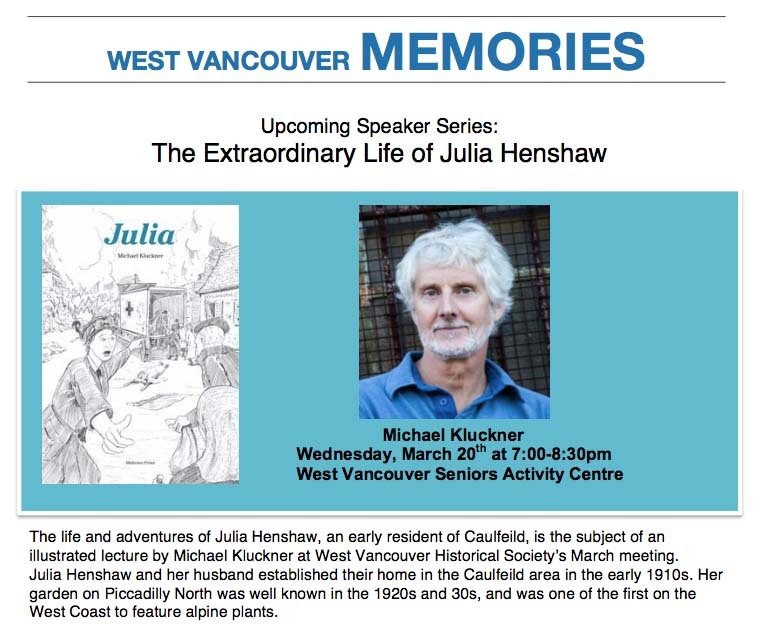 • Vancouver Historical Society, Museum of Vancouver, October 25th, 7:30 pm. My graphic novel/biography of Julia Henshaw, a notable writer and explorer who won the Croix de guerre for her work during World War I, exactly a century ago, is about to be published! Details about the launch and public events will be posted here and on my Facebook page. 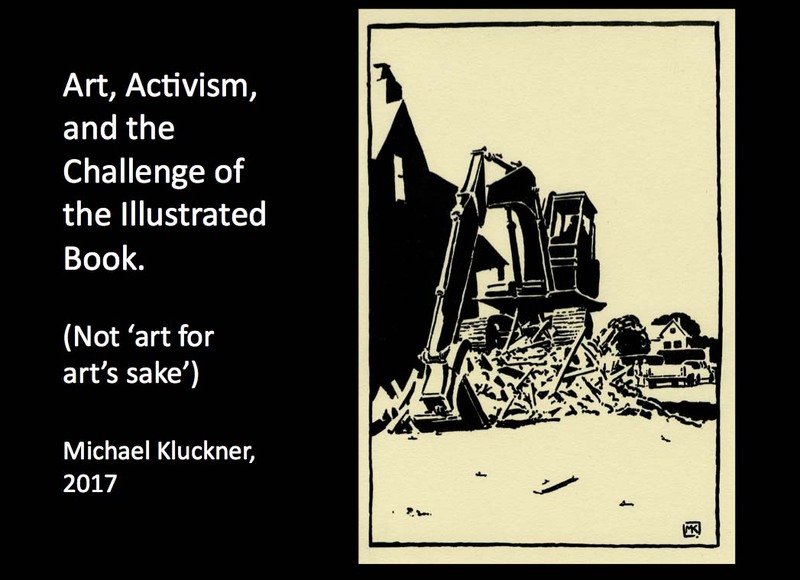 The Alcuin Society of book collectors invited me to speak at their AGM in the summer of 2017 and published my talk – in effect of an overview of my career so far – in their Summer 2017, No. 176 issue. There is a pdf of the article downloadable here or my clicking on the image above. that are part of my travel page. 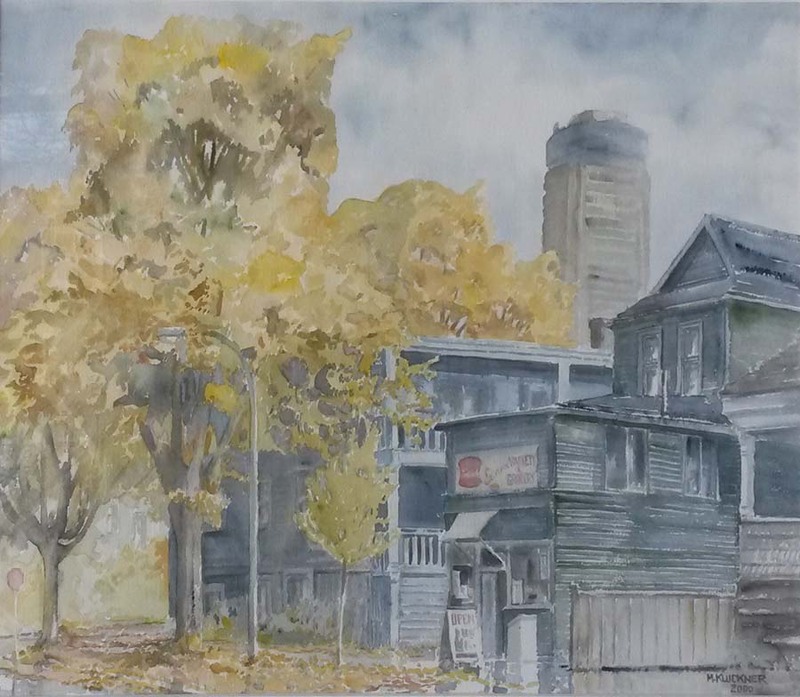 The relentless rain in Vancouver reminded me of this watercolour from late 2000 (unsold by the way, hint hint); the little store closed, was renovated, and then reopened as a cool café called Cardero Bottega, and the neighbouring buildings are still going strong. However, the Landmark Hotel in the background mist, the tallest building in Vancouver in its day, is about to be demolished and replaced by luxury condo towers. Sic transit gloria mundi. And, a great set of photos of Coalmont from back in the day. My last two trips of 2017, Indonesia and a brief one to San Francisco, now posted on the travel page. Christine's excellent book, which I illustrated, onto my books page. 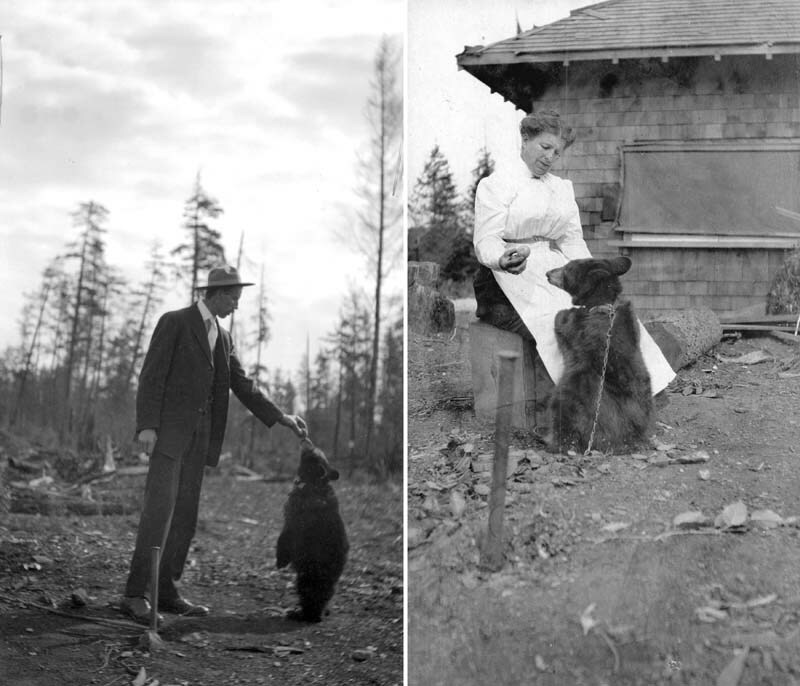 and the story of the Uyede family at Bamfield on Vancouver Island. It's been a long time since I posted anything here. 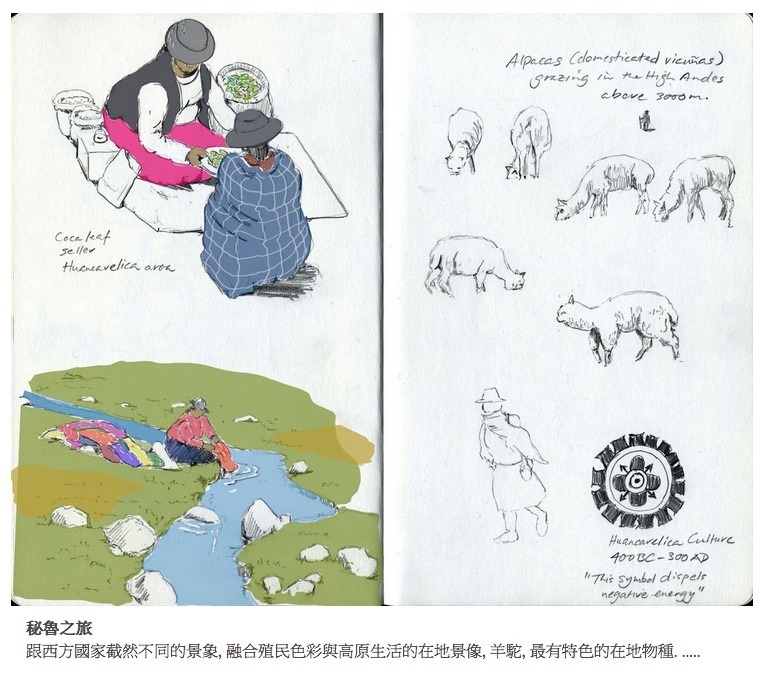 Some of my travel sketches from Peru and Mexico are on a Taiwan lifestyle/fashion/art site called Muse Creative, with the brief article in both Chinese and English. And, we're just back from a month in Indonesia, so the usual images and text will be added to the travel page some time soon. is on my website here. Queen Anne neighbourhood. 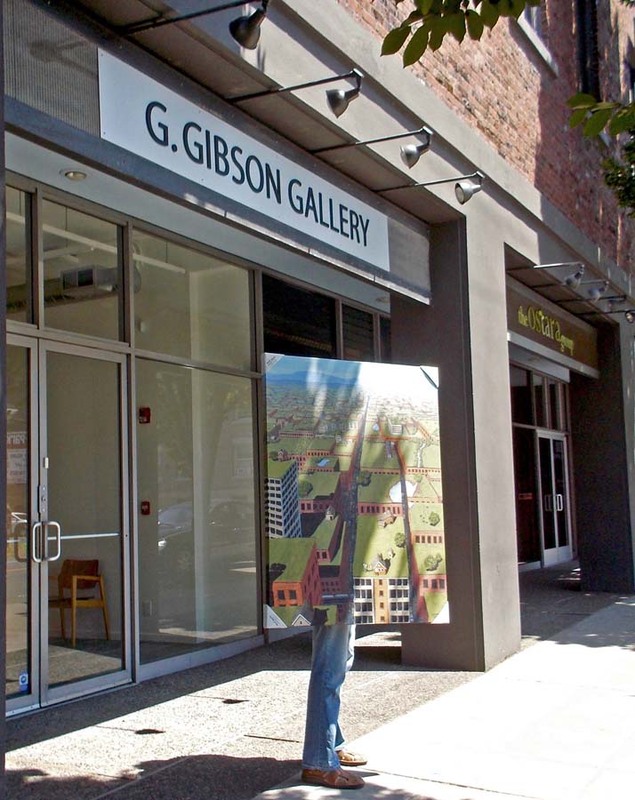 Exhibition website is here. 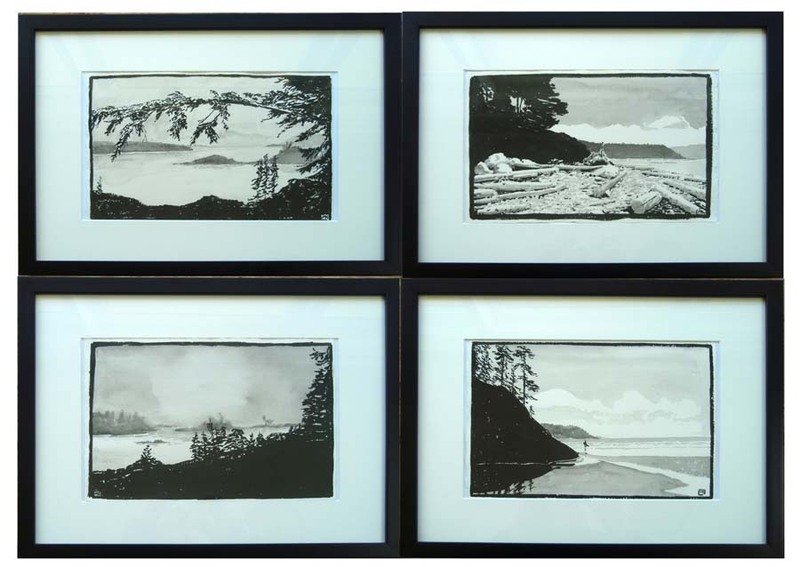 Successful show at VanDusen – the "preview" link below is up-to-date on what sold. of bibliophiles, at Hycroft in Vancouver following their AGM at 7 p.m.
"Mainly Vancouver," which is maybe my Last Picture Show (at least as a solo show), opens on Saturday, April 29th at VanDusen Garden Gallery, on Oak near 37th in Vancouver; opening reception that afternoon from 2:30 – 5:30. 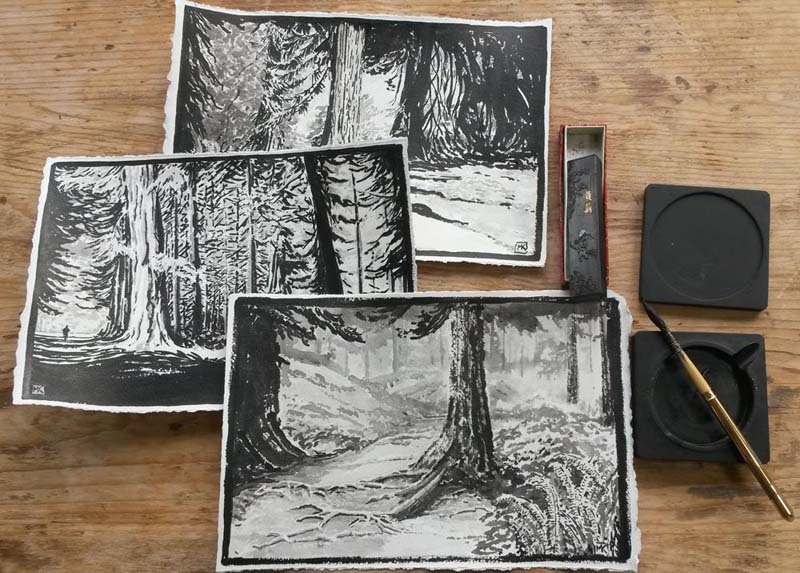 Lots of watercolours done as illustrations for my various books, plus chiaroscuro brush & ink drawings and oils. There's a complete preview here. 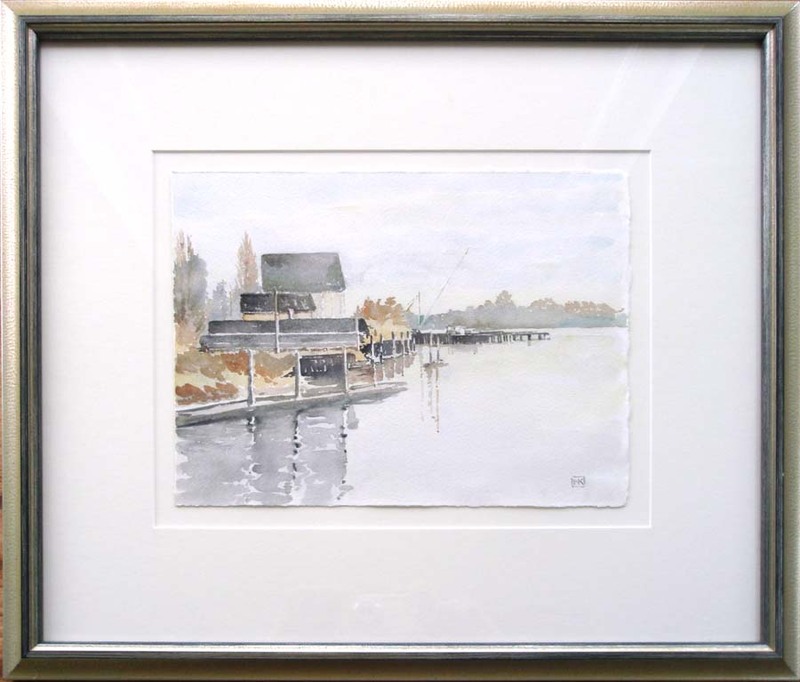 I've got a couple of small pieces in the "Art about Finn Slough" show at the Richmond Cultural Centre, on April 6, 7, 8, and 9, and am getting everything together for a show in the gallery space at VanDusen Garden, opening on April 28th. Details to follow. 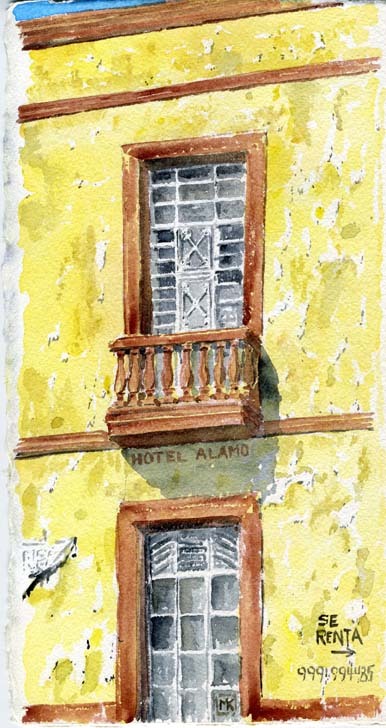 Peru, with a brief visit to Ecuador, the latest in the long list of trips on my travel page. Some photos from Al Hosokawa about his Japanese-Canadian family in the Shuswap post-war. • and a very informative piece by Al Hosokawa about Japanese-Canadian families in the Tappen area. 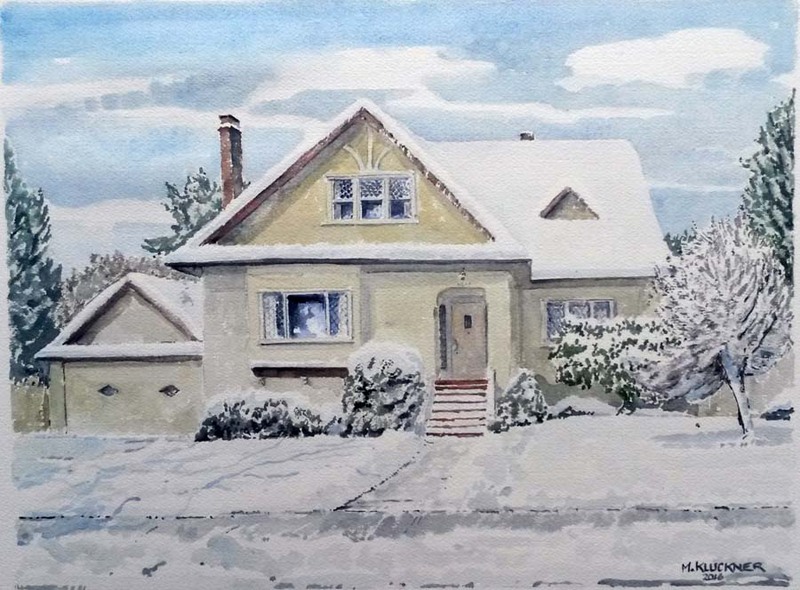 A commission (added to the Commissions page) from a snowy December in Vancouver. 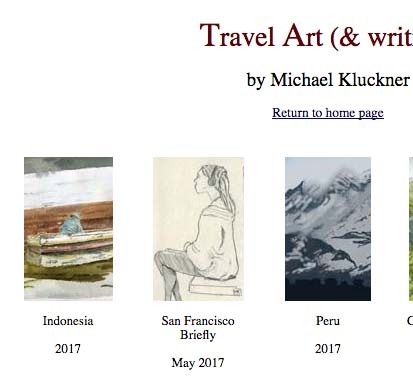 added to the long list of journeys indexed on my travel page. 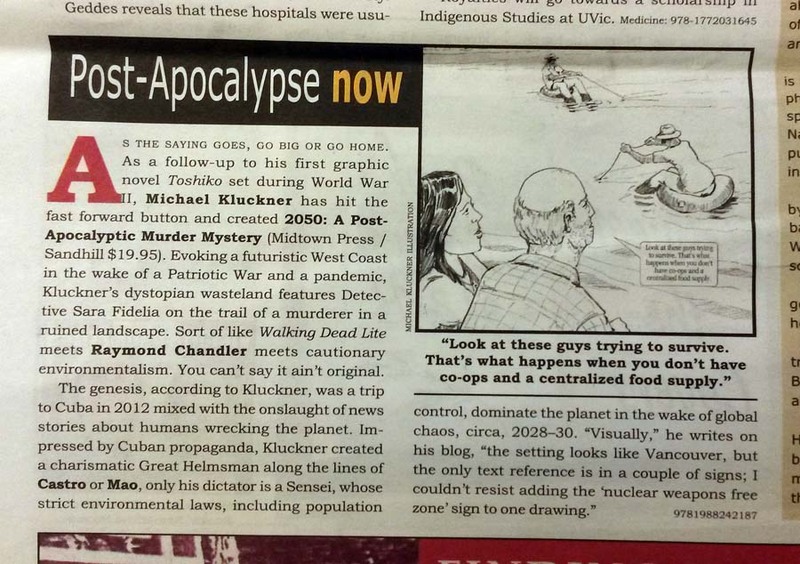 2050: A Post-Apocalyptic Murder Mystery, my new graphic novel, will be launched on November 9th, 7 pm, at the Book Warehouse at 4118 Main Street. Please come to the launch and check out a preview of the book here. 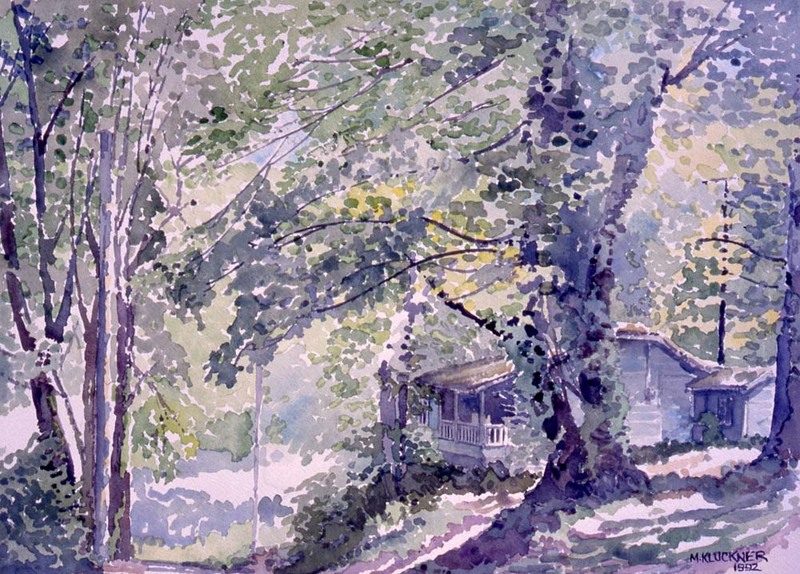 Summertime is commission-painting time: a couple of additions to that page. 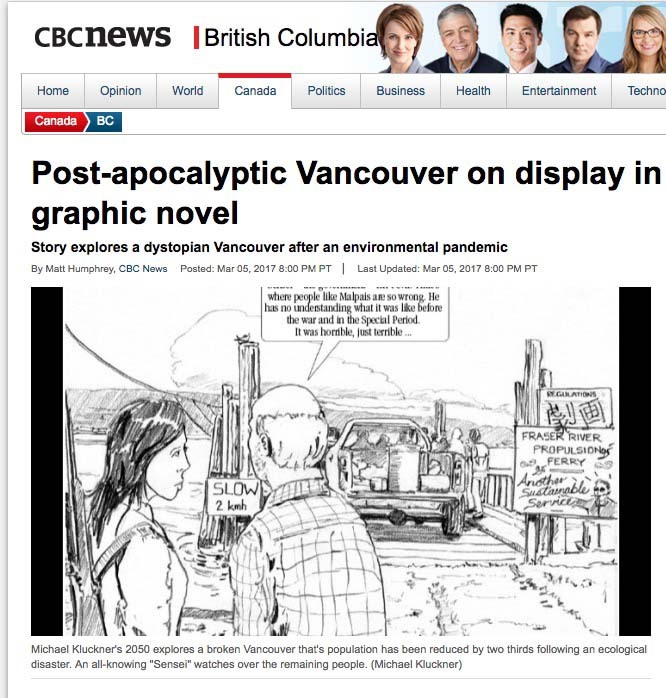 A piece avec moi on the CBC national program The Current about Vancouver and its housing woes. Prompted by the talk I gave on Bowen last month, I've put the images and text, more or less, onto this site here as part of the ongoing Vanishing B.C. project. 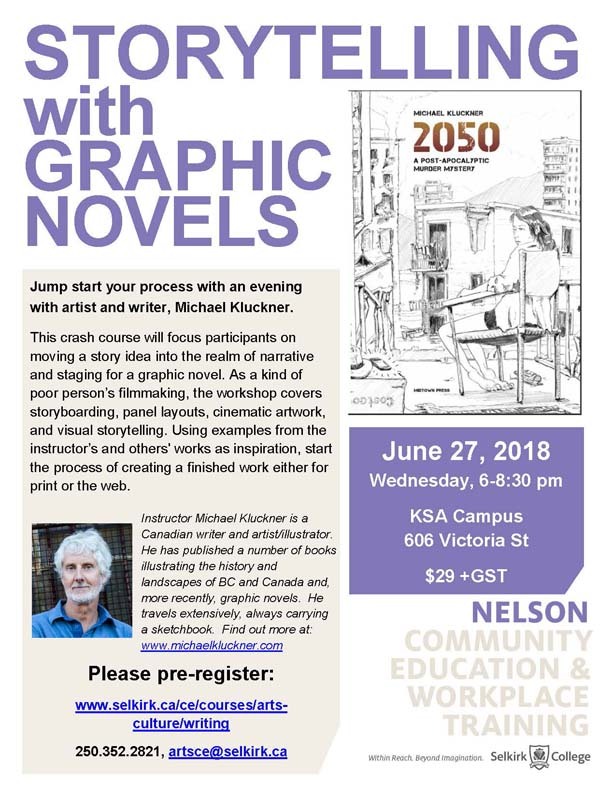 And, on July 15th, I'll be moderating another of the SFU Philosophers' Café events, this time on graphic novels – are they for dummies or are they a real art/literary form? •all children's books are graphic novels. 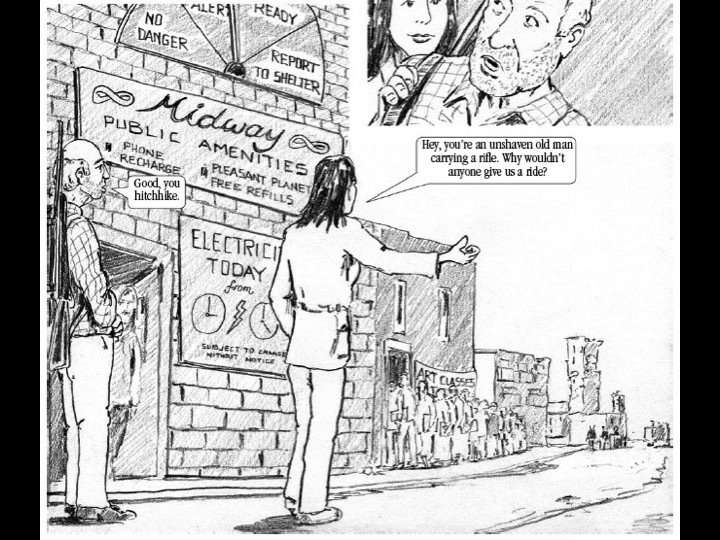 •graphic novels manage to tell both light and serious stories. •the most accessible graphic novels tell a story from a personal point of view, i.e. first-person narration. 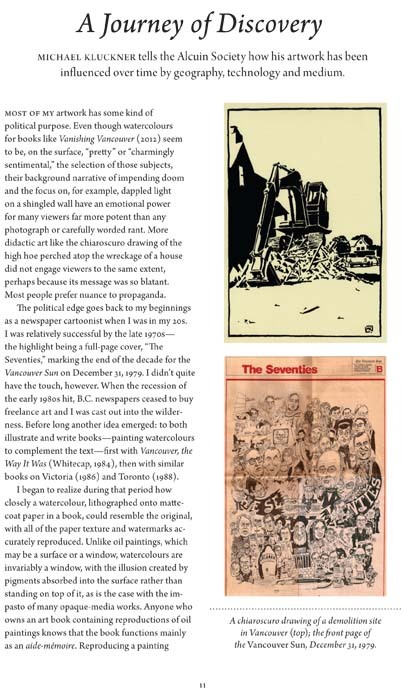 •early graphic novel pioneers include Franz Masereel and Lynn Ward; other classics include Maus, Persepolis, and works by Joe Sacco. 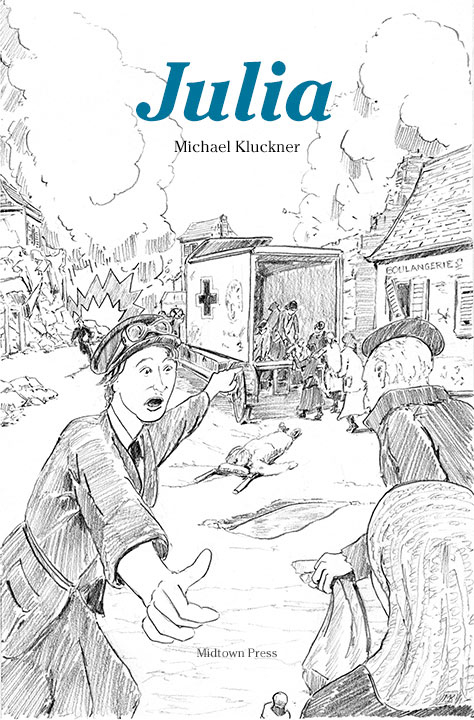 Chester Brown's Louis Riel tells a complex story with very spare, elegant artwork. 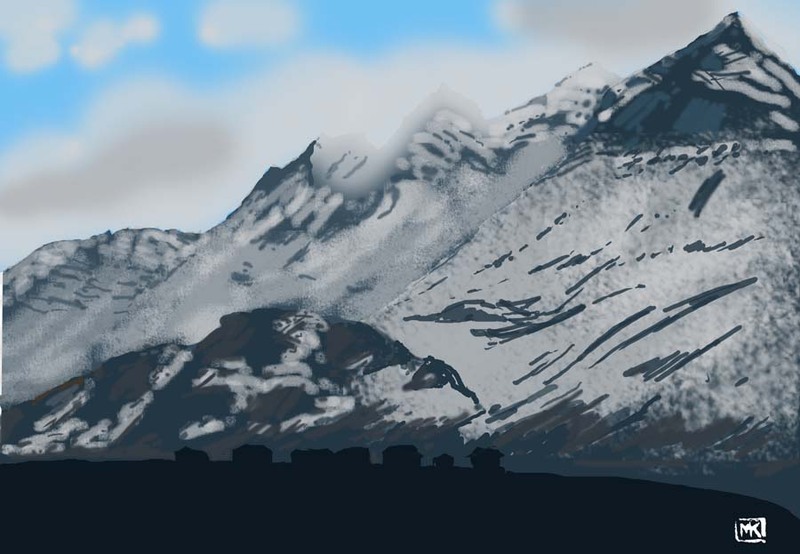 •ESL speakers (or any second-language speakers in any culture) can get clues from the visual aspects of a graphic novel to bridge the gap in their comprehension of the language. 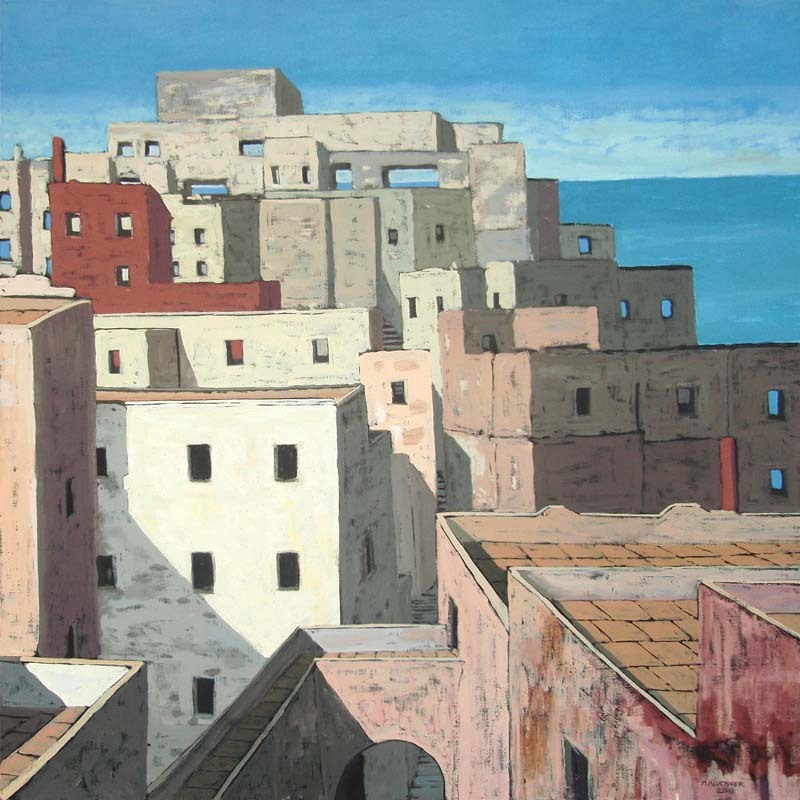 •graphic novels, such as Shigeru Mizuki's Showa series, may be a way to open a door into a deep understanding of history, while providing good historical grounding themselves. 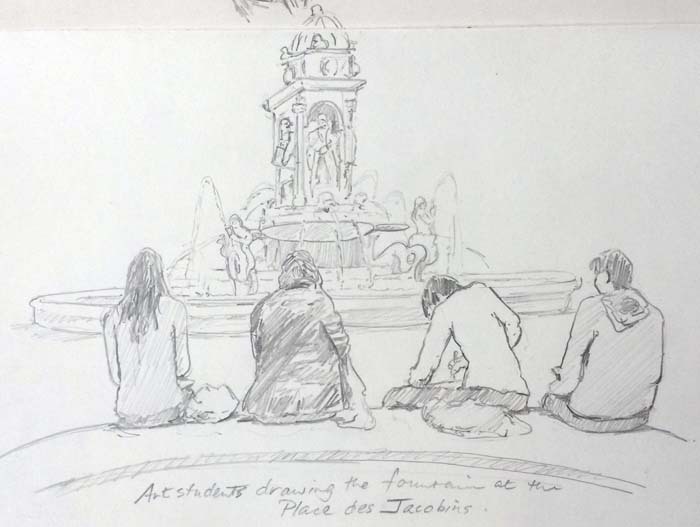 June 17, "Whatever Happened to Free Time?" one of the SFU Philosophers' Café events, at the Oakridge Library at 7 pm. 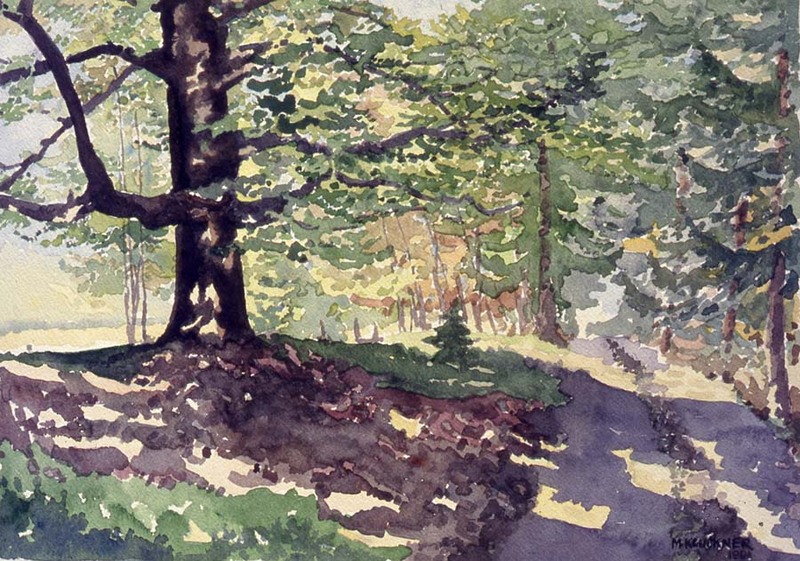 June 19, I'll be talking and showing paintings from earlier days (at least my own earlier days) on Bowen at the AGM of the Bowen Island Historical Society, 2:30 pm. 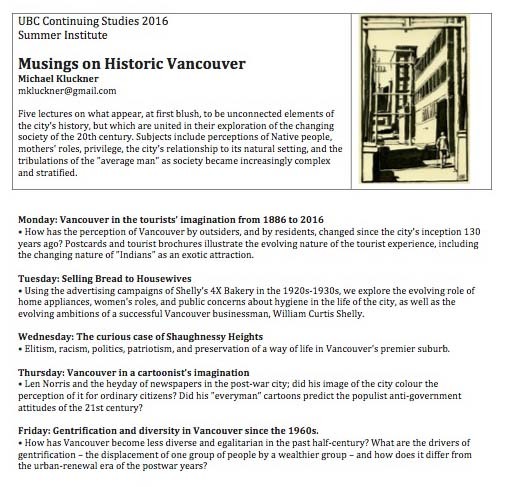 June 20 – 24, my course (a set of 5 lectures) called Musings on Historic Vancouver, part of the UBC Continuing Studies program. 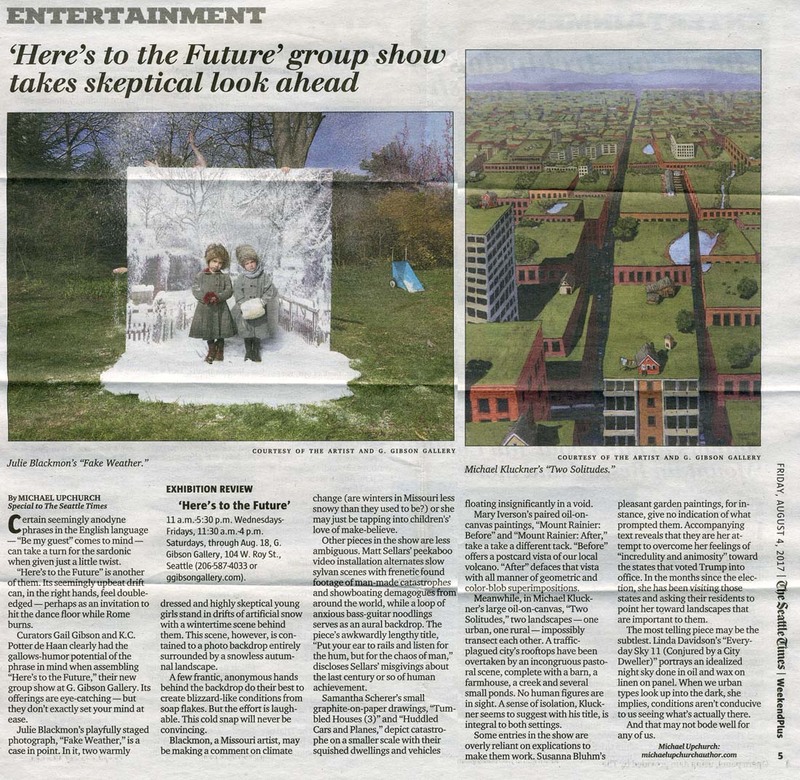 We don't have a publication date yet for 2050, but it will be this year. I'm at VanCAF at the Roundhouse Community Centre on May 21–22. It's free, drop by! What have I been doing lately? Working on a second graphic novel, explaining my absence. 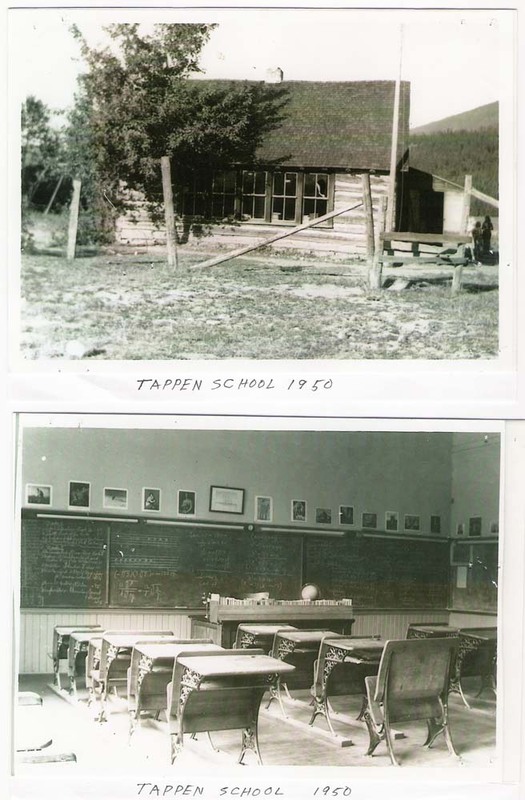 I've added a few notes to the Vanishing BC sections, including pictures of the now-demolished Judge Haynes house in Osoyoos, some more correspondence and photos about North Bend, and a 2000 article about a reunion of people at Tranquille. Upcoming events include a couple of talks about Toshiko, teaching at UBC during the summer, teaching at SFU Harbour Centre in the fall, and a variety of other lectures, all to be added as the dates get closer. 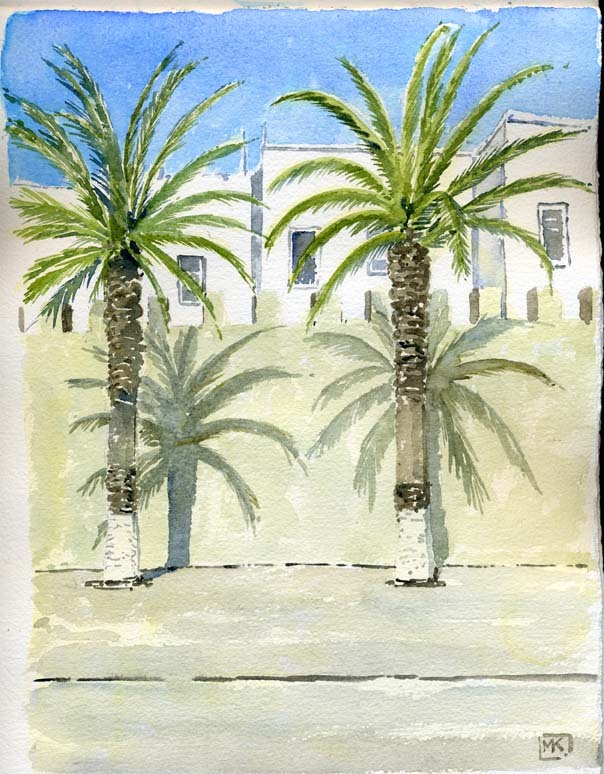 Art and a bit of writing from our recent trip to Morocco, with time spent in Spain en route, added to the long list of trips on my travel page. 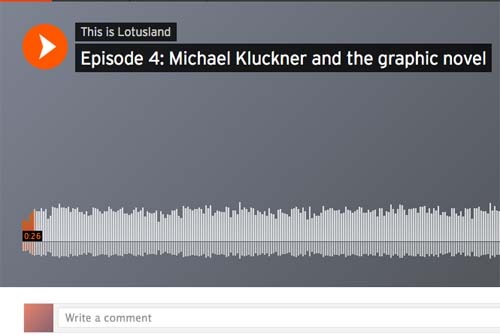 This is a good long podcast interview with Barry Link about Toshiko. 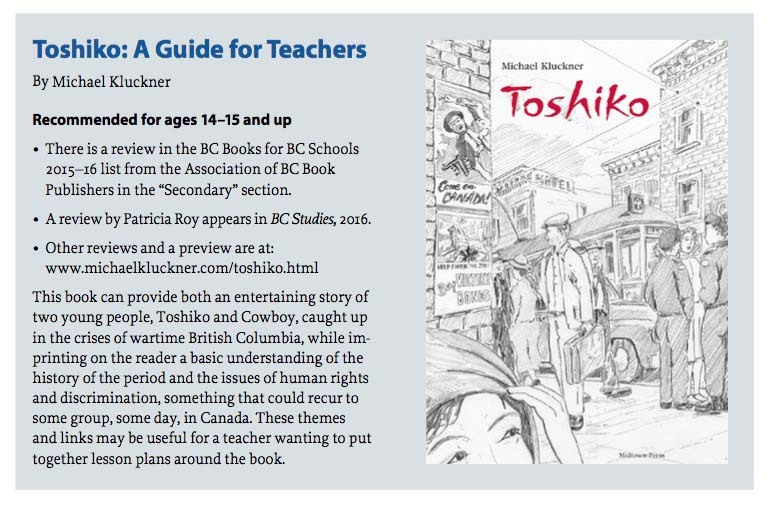 Click on the image above to go to it or find it in the review section on the Toshiko page. I don't normally flag additions to the Vanishing BC pages, as there are too many of them, but the set of photos of the Tranquille Sanatorium is very good, as is the information from Tara Rose about Blakeburn, including a pay sheet of her grandfather's from 1929 – wages of $5.60 a day for a coal miner.